I recently added soles to my knit slippers (see that pattern HERE) and wanted to share with you how I did it. Its super simple and you can customize the sole any way that you’d like. The way that I did it was by cutting two small ovals out of suede and attaching to the bottoms of my slippers. You can certainly make a sole all in one piece. I suggest drawing out your sole on some scratch paper first. Once you have cut your first sole out, use that as a template for your second sole. This way they will match perfectly. 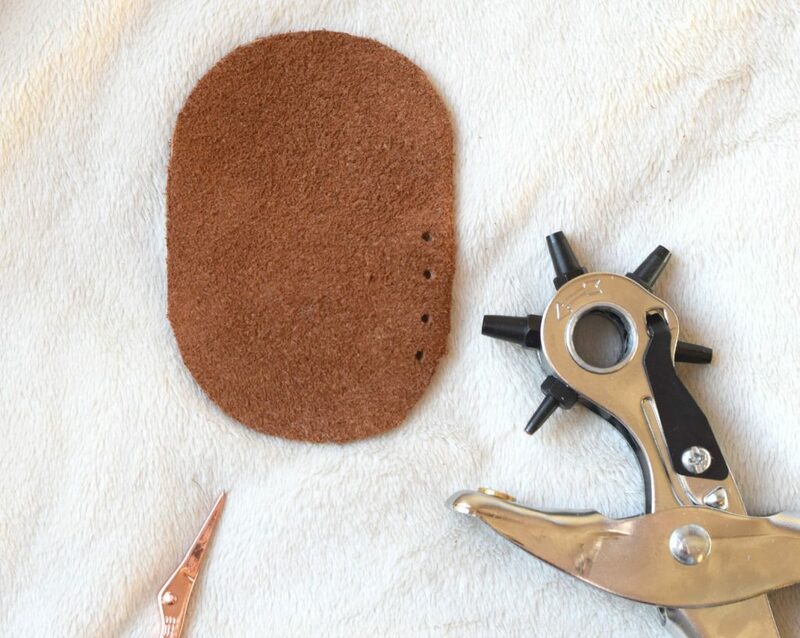 With your faux leather, suede or material of choice, cut an oval shape with the longest portion measuring approximately 4” inches long, and the width 2 ¾” inches wide. 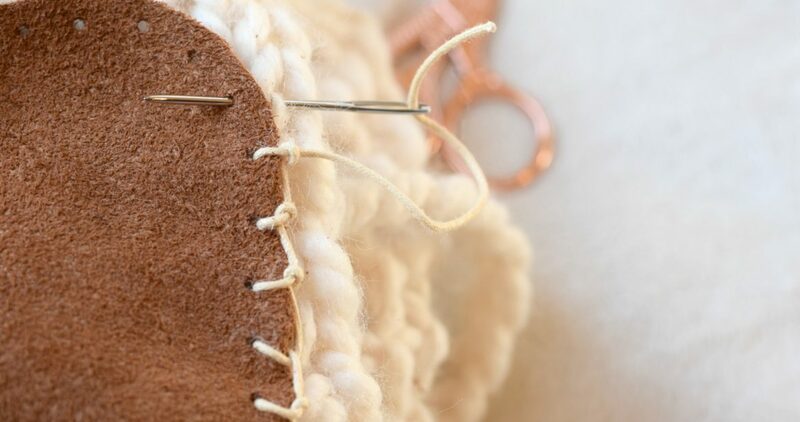 Place the larger oval toward the front of the foot on bottom of slipper and attach with the blanket stitch as pictured below(I used waxed thread). Next place the smaller oval on the heel of the slipper. 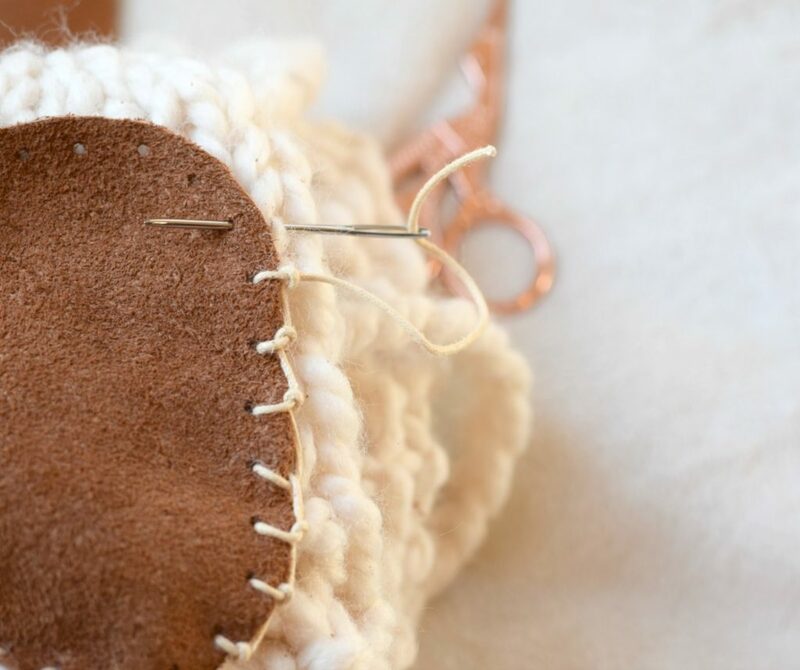 Attach in the same way with the blanket stitch. I prefer to use my tapestry needle and waxed thread to attach the soles. Waxed thread is more durable than regular sewing thread or crochet thread. Continue around and tie off, weave in ends. 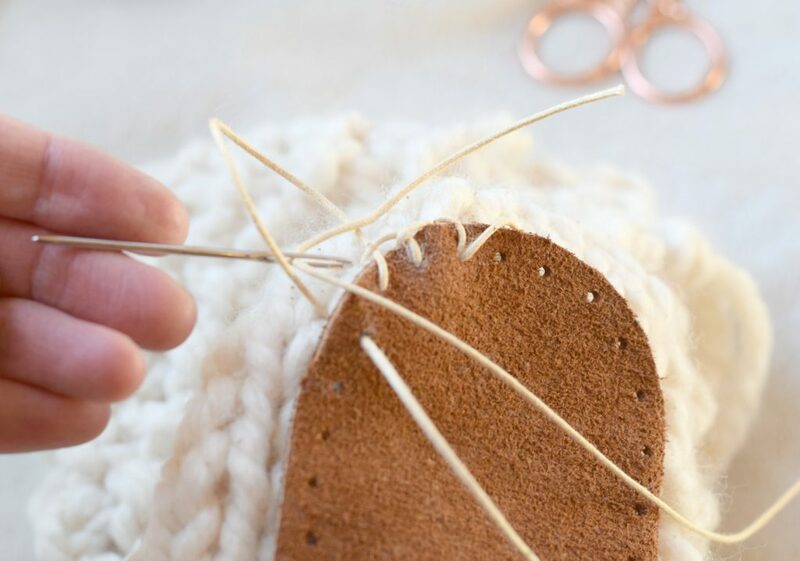 Adding soles to your knit and crocheted slippers can be so easy, can’t it? Have a great day and enjoy your slippers! Feel free to check out my Mountain Chalet Knit Boot Slipper Pattern here! As fun as it is to slide around in my crochet socks, it’s pretty dangerous at times – especially when my kitchen has laminate flooring! This is the perfect solution – thank you!! Great idea, i’m going to make a pair. What brand of leather punch did you use? Thanks so much for sharing! Oh wow. I don’t know the brand of my leather punch. I’m pretty certain I bought it at either Hobby Lobby or JoAnn Fabric. They aren’t the cheapest, but it’s handy to have around. Perfect, just what I needed! When ever I’m “googling around” for a pattern or idea and I see something by Mama In a Stitch I know I’m going to find exactly what I need! Your instructions are always clear, straight forward and I know the supplies won’t break the bank…once again, you came through! Thank you!! Aww that means a lot to me Luanne! Thanks so much! What thickness of suede should be used,1mm or .5mm or…. ?